In the special and magical places of my childhood in Wales and Scotland , I was always drawing. When I was very small , the images were of aeroplanes ; it was 1944 and there was an aerodrome near our house. The landscape began to appear when I was in my teens and away at school in unhappy exile from these sacred havens , which always offered a place to travel inner worlds of dream , joy and peace. The pain of separation and the longing to reconnect have been dominant forces in most of my subsequent work. 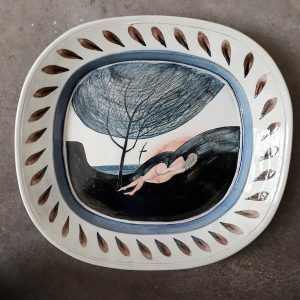 Over the years spent as potter , teacher and draughtsman , I came to love drawing , variously , as a tool for generating ideas about shape , for speculating about form and image , and as a language for putting down images of landscape observed , remembered , and imagined. The pastels and watercolours have developed over time , from sketchbooks full of attempts to capture the poetry of these special places : they are meditations on landscape. Some are closer to the external facts , some closer to the inner world. The bird is a frequent presence ; it often seems to be searching for something within the landscape , and it is probably me. 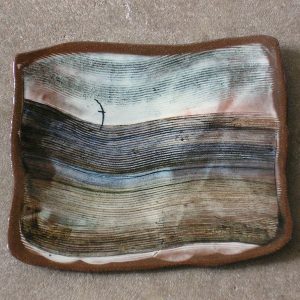 I’ve been making pots since about 1957 ; they were initially sculptural, slab built forms, but in 1983 the need to furnish myself with plates, bowls and jugs, along with a six week visit to Japan, prompted a renewed interest in the vessel, and since then most of my work has consisted of platters, dishes, jugs, jars and related shapes. I try to make pots where form and image coexist as equal partners. They are in different languages, and to bring them together into balance is an endlessly fascinating puzzle.